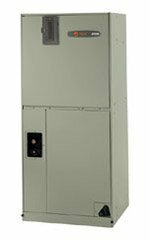 The fan motor inside Trane’s variable-speed air handler is designed to vary its speed based on your home’s heating and cooling requirements. That’s the beauty of the variable-speed technology ¯ when matched with any of Trane’s Xli series of outdoor units, it gives you a reliable, consistent level of quiet comfort and saves energy in the process. Trane’s exclusive Comfort-R feature represents the ultimate in comfort. More consistent temperatures, greater humidity control and better air heating. Special insulation, door gaskets and thermal seals effectively seal in conditioned air, increasing efficiency and reducing your heating and cooling costs. Now with the latest generation of TEE Air Handlers you can have the flexibility of choosing built-in Trane CleanEffects technology. All other TEE models are Trane CleanEffects™ compatible, so the most advanced whole-house air filtration can be added for cleaner, healthier air.